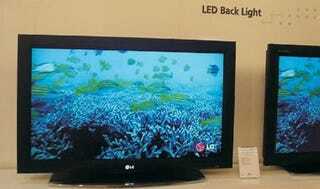 Even though they're a little late to the party, we're glad to hear that LG Philips will be rolling out its first LED backlit TV next quarter. The 47-inch display will have a progressive 1,920 x 1,080 resolution and because it's LED-based, it'll have an abnormally high dynamic contrast ratio of 1,000,000:1. There's still no word on pricing, though we'd rather wait to find out than have another price goof.